It is always nice when a show can go above and beyond your expectations. 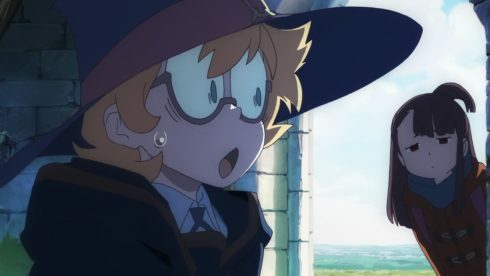 Anyone who has seen the Little Witch Academia OVAs had expectations going in, but there was no telling how good the full length series was going to be. I’m glad to say the first episode started off on a really strong note. It was certainly one of my favorite first episodes of the season so far. The road to this show even existing is an interesting one. 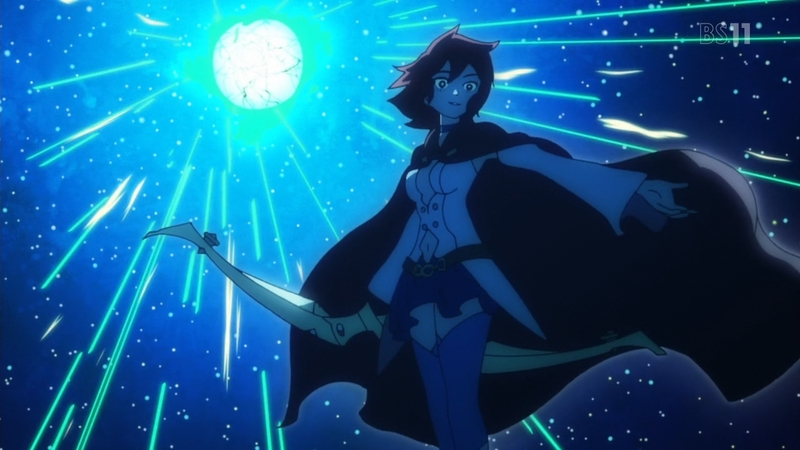 Trigger created the first OVA for the Young Animator Training Project and released back in 2013. They then partially sought Kickstarter funds for a sequel which came out in 2015. Now here we are in 2017 with a full 2-cour anime on our hands that will be taking the characters and general plot and running with them. In a lot of ways I was simply curious how they were going to handle the first episode. Would it basically just be a remake of the original OVA? Well yes and no. The start is very much the same, the characters are the same, and they both do involve Kagari Atsuko starting off at the school for witches Luna Nova. But the plot definitely goes in its own direction. I won’t spoil the OVA for anyone since it is definitely worth seeing on its own. Overall I’m pretty happy with the direction they went for this first episode. 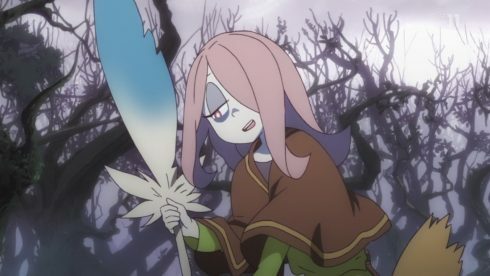 An episode just focusing on Atsuko (or Akko) meeting her eventual roommates Sucy and Lotte. Of course while that was the focus of the episode that wasn’t the whole thing. The fun part of this show is probably just going to be the setting. This show has its own idea for magic and magical society in general. 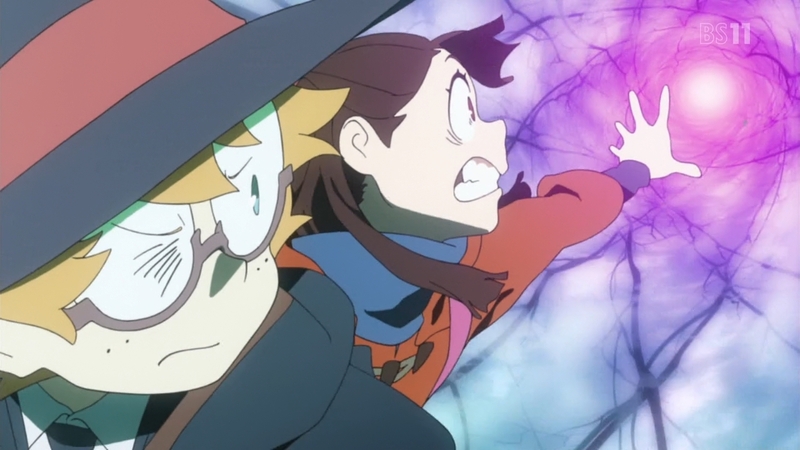 We can already tell that Akko is going to have a tough time with some people in this school. There definitely seems to be an elitist nature to some of the witches. Whatever having “witch blood” means, it might be a problem for Akko with other students that she doesn’t. I’m guessing that is some kind of class thing? 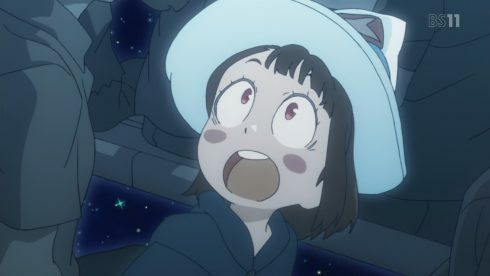 It doesn’t seem like you need to come from a certain bloodline to use magic period since Akko did just fine in this episode. 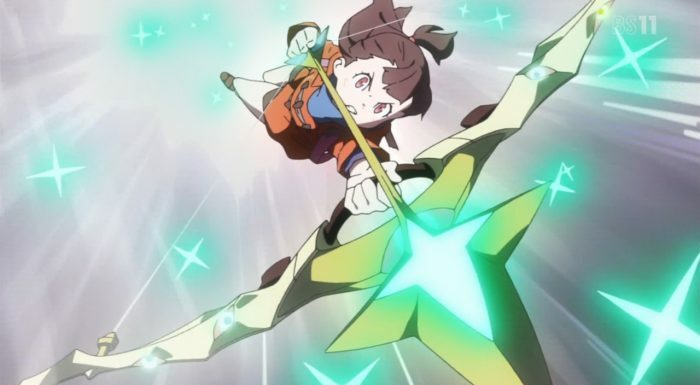 Although maybe Akko is an irregularity and she had to pass tests showing her having latent magical potential. That’s just one question I hope the show covers later. 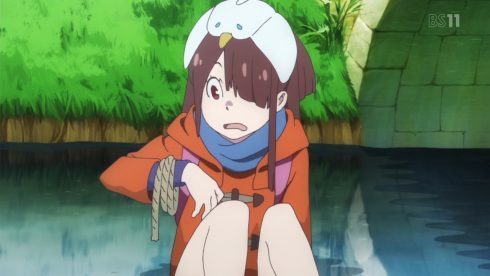 What is safe to say is that Akko is bound to run into some trouble. You have people who will treat her like a “commoner” just because of her background. Plus her personality is pretty darn upbeat and in other’s faces. 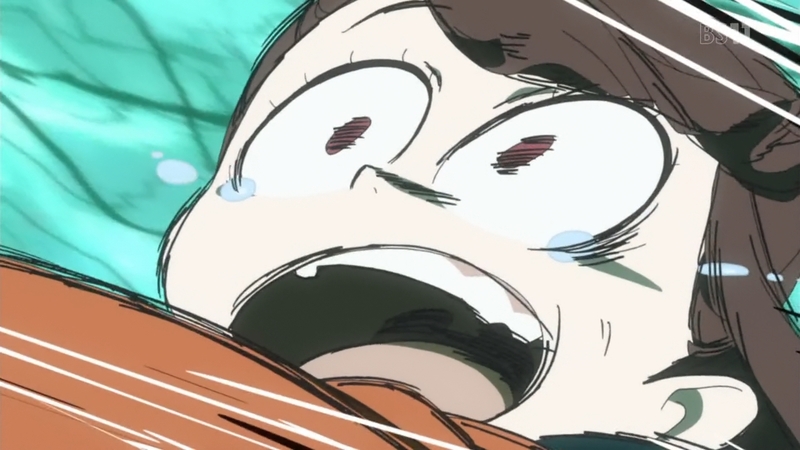 While things turned out fine by the end of the episode, Akko did run into trouble with Sucy initially. For the sake of comedy it worked, but wow Akko had a rough time with that girl. First the toy pecking her in the eye, then the rope trick, and even Sucy trapping her in that cage with Lotte. I kind of wonder how things will work out going forward since it feels like Sucy’s personality is a bit warped. The one fun thing is how much strange stuff they ran into during this episode. This world has the potential to show off some strange and magical creatures. We already got to see this series’ version of the mandrake plant and the cockatrice. 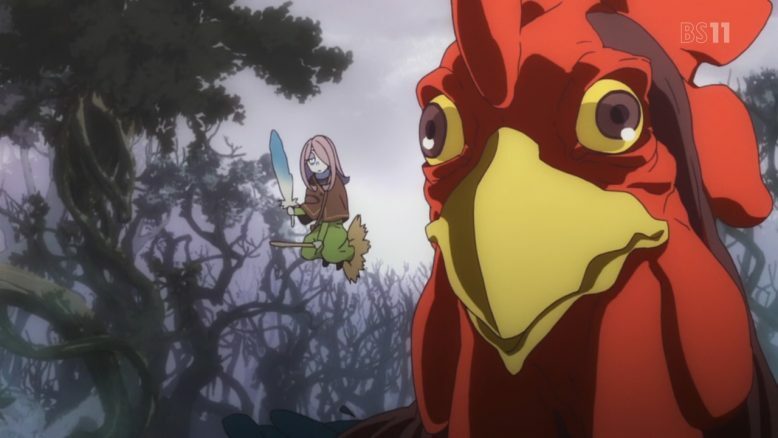 Talk about one dangerous giant chicken. Though I suppose any chicken with a snake for a tail is going to be dangerous. Just in this episode they were dodging petrifying breath, fire breath, and just a really large beak that would kill them on impact. And yet somehow the show still managed to make it all pretty light and entertaining. One question coming out of this is what the heck is the Shiny Rod? 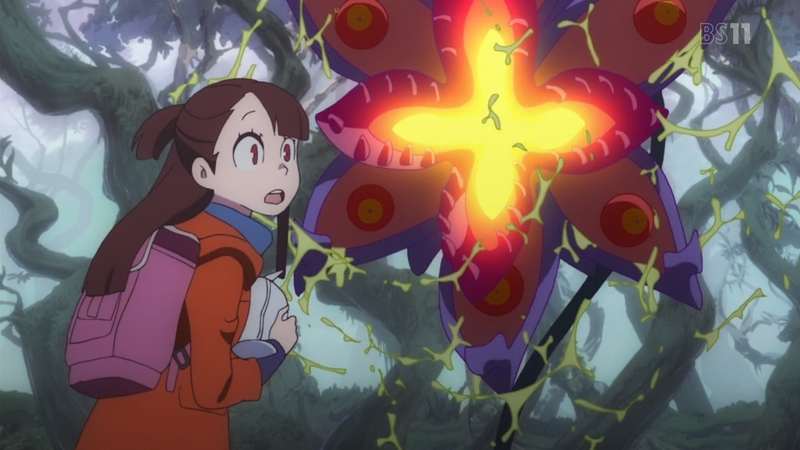 That thing just popped out of the ground when Akko needed it. We can presume that it has some kind of magic power that lets it transport to a person who has the right mentality for it. But how powerful is that thing? Who made it? 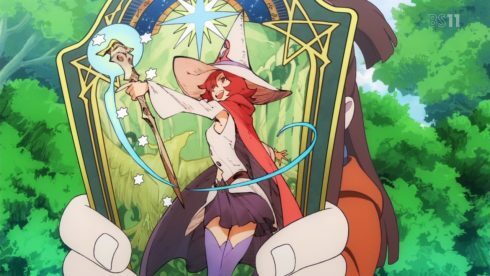 And why does Shiny Chariot no longer have it herself? That does also lead to the question of what happened to her. 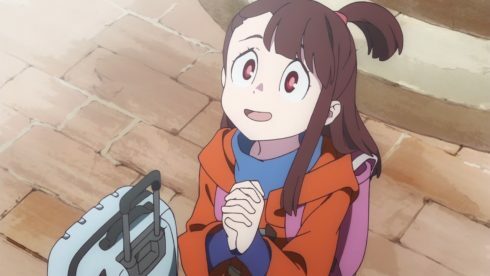 Although really it has been around a decade or so since Akko saw her perform last and it is possible she retired to do other things. It doesn’t sound like she’s been active for a while since people around Akko consider her to be stuck in the previous decade. The big question for me is just where the show is going to go. The OVAs were pretty self-contained stories and that made sense. Trigger probably never expected to do anything else with it after the first one. They just have the potential to tell a much bigger story with 2 cours. 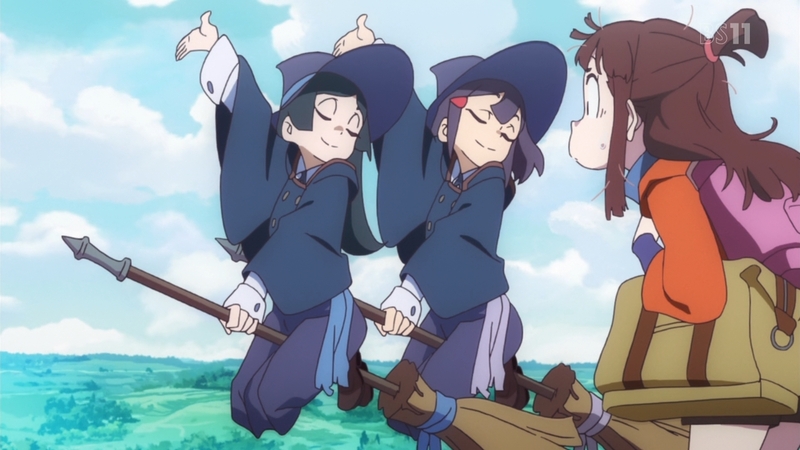 They could just have a couple seasons of Akko having fun at magic school with her friends, but I have a feeling we’re going to get more than that. We could see Akko turning into some kind of chosen one character with her finding the Shiny Rod which even a teacher at her school considers a big thing. Although the others didn’t seem to care much about her walking around with it…so who knows if it matters that much. In terms of a first episode this definitely worked. The story introduced the main cast and a bit of the world they inhabit. There is a lot of world building they can do with this show and the overall plot is still uncertain. 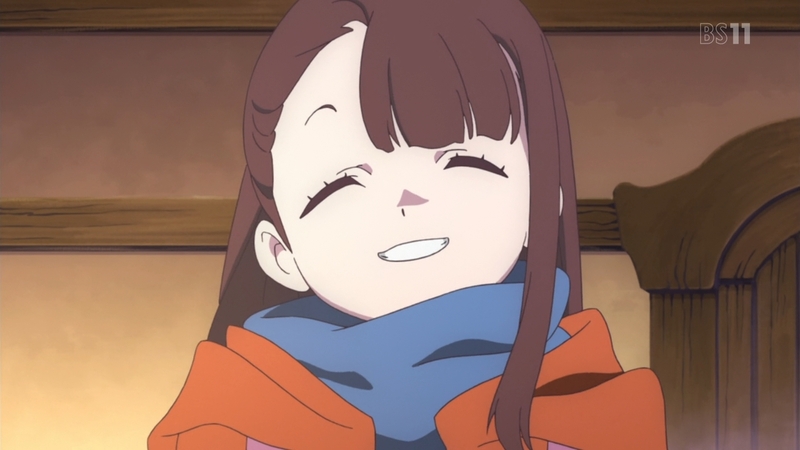 For now we’ll see how Akko settles in. The big issue for her is that she is lacking knowledge about the basics for magic. So I think catching up with her fellow classmates in terms of overall ability will be the first big step for her. Hopefully it’s a pretty fun experience for her overall. No telling if I’ll pick this up for the season, but it definitely deserved a first look post.